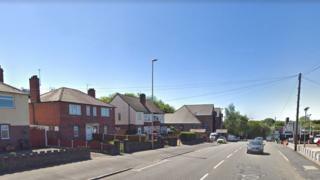 Two men have been taken to hospital after a fight in the West Midlands which involved a sword and cricket bat, police said. One man suffered a slash wound to his arm and the other a broken leg after being hit by a car. West Midlands Police said they were called to Stourbridge Road, Lye, at about 17:00 GMT on Friday. Investigations are ongoing to establish the circumstances around the fight, the force said.